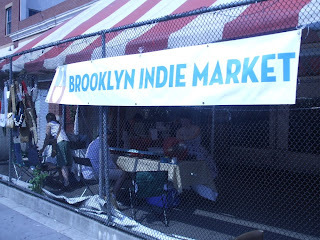 Yesterday I spent the day selling my handmade goods at the Brooklyn Indie Market. It was a beautiful day in the mid 80's and breezy. This was my first time selling at an outdoor market and it turned out very well! I sold many of my handbags and almost all my wristlets, which were a new addition to my collection made specifically for the market. I plan to add them to my Etsy shop very soon. My first customer was a lovely french woman who purchased two purses. 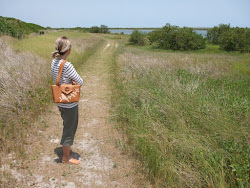 She picked a light gray purse with a bird on a branch applique and a red one with a bird applique. I met so many wonderful and talented artists selling their creations at the market such as Scarlet who makes really cool screen print designs on clothing and also makes jewelry . 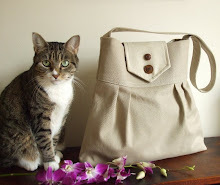 She has two shops on Etsy, Made by Scarlet and Begonia44. Sitting next to me at the market was Arien of Turquoise Dreams who makes amazing handmade resin jewelry using vintage postage stamps and other delights. Rebecca Shepherd was selling her beautiful and unique handmade jewelry. My favorite piece of hers was inspired by a sea urchin. 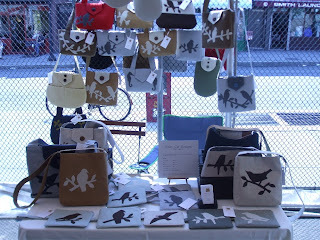 MaryAnne of Wabisabi Brooklyn had her amazing handmade decoupage jewelry for sale. Phil and Sara of Rocks and Salt were selling their handmade hats and other cool accessories, Svetlana had her lovely unique handmade jewelry for sale and Beacon Bookmarks had the coolest handcrafted wooden bookmarks. 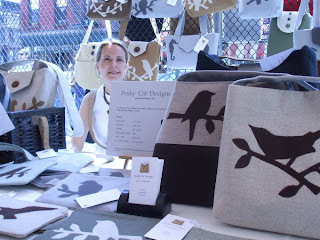 There was Waldorf Handworks with amazing felted sculptures, beautiful natural wood jewelry by Via Nativa, Jenky Production t-shirts and so much more! Special thanks to Kathy Malone for organizing and running this wonderful market. She is also a very talented designer and her collection of handmade apparel is available at the market every saturday and at her shop Fofolle. Check out BIM's photostream uploaded on July 12th and 13th to see all the amazing work! Thanks for the great blog post! Your work is absolutely beautiful. I hope to see you at the market again some day!